Black with silver trim Dell Inspiron 3000 i3647-1231BK is a beautiful compact PC in a small form but doesn't sacrifice on performance with the latest 4th generation Pentium processor and 4 GB RAM. It works extremely quietly and you won't hear it even in a quiet room. 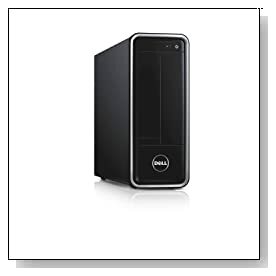 Dell Inspiron i3647 comes with a Haswell Intel Pentium-G3220 dual-core processor with 3M cache at 3.0 GHz speed and Intel HD Graphics card, 4GB Single Channel DDR3 SDRAM at 1600 MHz and 500 GB at 7200 rpm Serial ATA 6 GB/s hard drive.. This Pentium processor is almost an equivalent of Intel i3 in terms of performance but works on much less power and costs less- which is reflected on the price of this PC but it offers a way better price to performance ratio than the i3. It is ideal for daily computer tasks, like editing photos, playing music, watching high definition videos but not really for Autocad or the 3D games. You'll find 2 DIMM slots and one of them is occupied with the 1 x 4GB memory card, which is more than sufficient for most computer users to run several programs at once. 500GB hard drive is a fairly generous amount of space for file storage and works at 7200 rpm rotating speed (most laptops come with 5400 rpm) so it is faster than normal. The operating system that you'll find pre-installed is the latest Windows 8.1, with extra functions to Windows 8 and if you are not a big fan, you shouldn't take long to get used to it. This Dell Inspiron desktop is quite a small PC that will save you on space on your desk, with the dimensions of 10.5 x 4 x 15 inches and weighs just 13 lbs (info from the manufacturer's website) and runs so silently that it will be hard to notice when it's turned on. So you get the power of a large desktop in a compact system that happens to be also very quiet. It comes with a Dell KB113 wired keyboard and Dell MS111 USB 3-button optical mouse but naturally not with a screen. You'll see 2 x USB 2.0 ports, 8-in-1 Media Card Reader, Tray Load DVD Drive that writes and reads to DVD/CD, Head phone / Microphone jacks at the front and an HDMI port, a VGA port, 4 x USB 3.0 ports, 3-stack sound jacks for 5.1 surround sound, RJ-45 (10/100/1000 Ethernet) at the rear. You also have the Dell Wireless-N 1705 802.11 bgn and Bluetooth 4.0 via 1705 WLAN card for wireless connection. 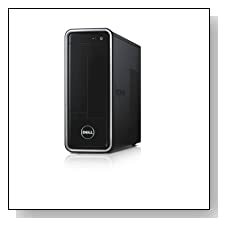 Conclusion: Dell Inspiron i3647-1234BLK (the newer version), like the other desktops in the new 3000 series of Dell, comes in the same compact case offering good performance, more than adequate memory and storage for daily tasks and a nice set of features and connectivity options so it is overall a 'great value for $' desktop PC. One thing some customers may not be happy with is the latest Windows 8.1 as it looks and feels foreign to them, which they can change to Windows 7 easily if they have the installation CDs. Dell still offers (one of) the best customer support service in the computer industry, in case you need it. So if you are not in the market for an extreme gaming PC to play the latest games or run the demanding advanced engineering software, this could well be the one for you.